The Madrileños have a saying: “De Madrid al Cielo,” which would directly translate to “From Madrid to Heaven.” However, the real significance of the phrase that has become some what of a mantra for the Spanish capital is that if Madrid isn’t heaven, it’s about the closest you can get to the pearly gates themselves. 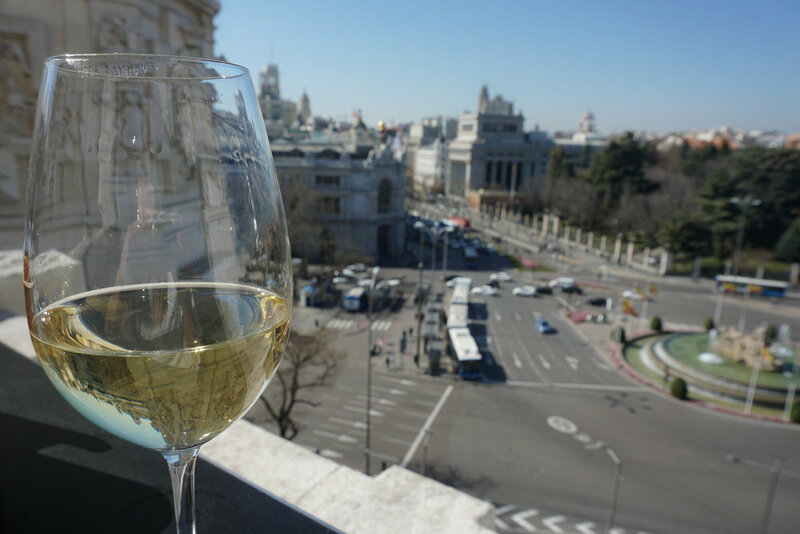 In order to pay homage to my favorite city’s motto- I saw it fit to share a list of my favorite rooftops because, let’s be real- a glass of wine on a Spanish rooftop truly is heaven on Earth. I don’t take my rooftop evaluations lightly, and I have to say Picalagartos is hands-down the best rooftop view in Madrid. Located at the top of the NH Hotel in the heart of the city center, there is no excuse to miss out on 360° views of the Spanish capital. PRO Tip- get there just before sundown to score a table along the edge before the crowd trickles in. Getting there: Metro stop Gran Vía (lines 1 & 5), Sol (lines 1, 2, & 3), or Callao (lines 3 & 5) will get you within walking distance of the NH Hotel. Once inside the hotel staff will direct you to the rooftop. Picolagartos may be my newest obesession, but the rooftop bar on top of the Círculo de Bellas Artes is my first love. I make it a point to visit every time I find myself in Madrid, and the view never gets old. Getting to the top only sets you back about 4 euros and it’s worth every penny. Getting there: I usually just walk all the way down Gran Vía from Plaza del Sol, but if you’re not feeling the walk, Metro Banco de Espana is pretty close by (Line 2). I’m a bit biased about this one because there’s an up close and personal view of my favorite building in Madrid- The Metropolis. Unfortunately the actual Terraza at the hotel was closed when I went due to seasonal weather, but the views were still amazing and the restaurant adorable. PRO Tip: Go between lunch and evening (2PM-5PM) and you might just have the entire place to yourself. Getting there: If you’re at Bellas Artes, literally walk across the street and it’s right there. Otherwise, Metro stops Chueca (Line 5) and Banco de España (Line 2) will get you within walking distance. The 9th floor of the El Corte Inglés building in Callao is an unparalleled chance to escape the chaos and crowds that flood the city center. The top floor sports restaurants stalls with rows of counters and shelves lined with gourmet cheeses, wine, and other Spanish fares. The only downside is that it’s ALWAYS crowded. To avoid wandering around in the crowd- I’d recommend heading straight for the cheese counter where a glass of wine comes with a gourmet manchego tapa. Getting there: Take the yellow (3) or green (5) to metro stop Callao. 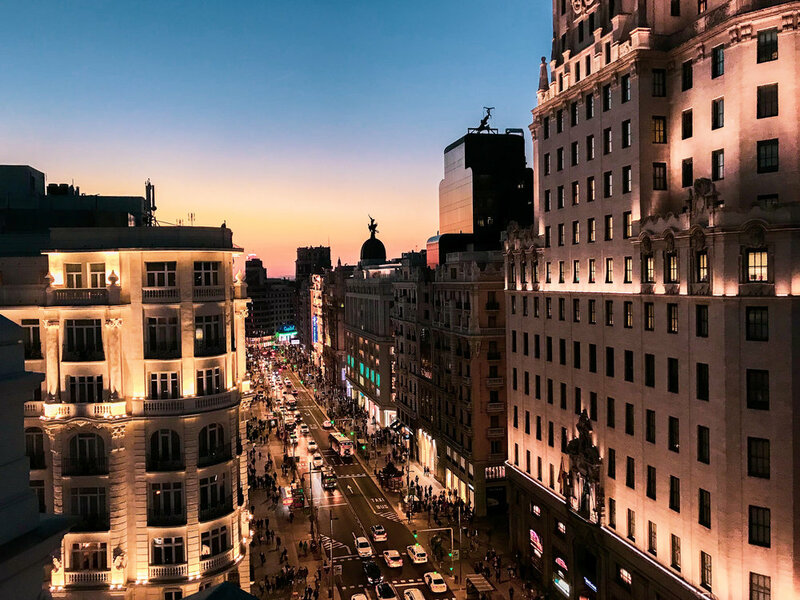 Take the Plaza Callao exit and make your way to the El Corte Ingles that’s next to the Starbucks (there are multiple near Plaza Callao) and take the elevator to the 9th floor. The La Latina area is where I truly fell in love with Madrid, so I had to include this one. What Viajero lacks in height (compared to the rest of the rooftops on my list), it makes up for in gourmet cuisine and an amazing atmosphere. Squatters rights apply in Spain, and groups of friends will sit for 4-5 hours, so get there before 1pm if you want a chance at scoring a table for lunch. PRO Tip- Even if you can’t get into Viajero, La Latina is the best neighborhood to grab a table on a patio and drink until the sun goes down. Getting there: Take the green (5) line to metro stop La Latina. If I’m being completely honest- the terraza at the Correos building isn’t necessarily my favorite rooftop view. That being said, it’s on the list because the building that it is on top of is amazingly beautiful (inside and out) and the bar itself is great. It’s especially nice for late night drinks or a sunset happy hour. Getting there: Take the red line (2) to metro stop Banco de España and walk into the Correos building (pictured below- you literally cannot miss it). Other rooftops worth mentioning (but not pictured) if you just can’t get enough of the Spanish skyline. Dear Hotel Madrid (Gran Vía)- I’ve heard amazing things about Dear Hotel Madrid’s rooftop, but unfortunately when I went it was closed for a private party. Hotel Oscar (Chueca)- Unfortunately it was closed the time I tried to go, but I’ve heard the views are amazing. Mercado San Antón (Chueca)- The view leaves a little something to be desired, but the bar up top has a great energy and is still worth a visit. Mercado San Idelfonso (Tribunal)- Again, kind of the same situation as Mercado San Antón, but if you can snag a table by the window it’s really good people watching on Calle Fuencarral. Have a favorite rooftop to add to the list? Comment below! Cinque Terre is exactly what you’d expect of the Italian Riviera. Colorful fishing villages dotting the coastline where life is slow and tourists flock from miles around to get a taste of the good life. I was lucky enough to find myself in Cinque Terre two summers in a row and found myself completely enamored by the people, the colorful houses lining the dramatic landscape, and just the general way of life. Check out this guide to effortlessly navigating the five perfectly imperfect villages that make up Cinque Terre. For starters Cinque Terre is not one single city, but five separate yet equally beautiful villages. The five towns are: Riomaggiore, Manarola, Corniglia, Vernazza, and Monterosso al Mare. They say that Vernazza is the most beautiful, but I (and the locals of the four remaining towns) would argue that each village brings its own beauty and its own charm. It’s definitely worth visiting each and choosing for yourself! The best way to get to Cinque Terre is via La Spezia. We took a train from Genoa (which is also worth the visit if you have time), but there are trains from most of the major cities in Italy. A train from Milan or Rome will get you there in about 3 hours. You can book tickets the day of at the train station or online here. 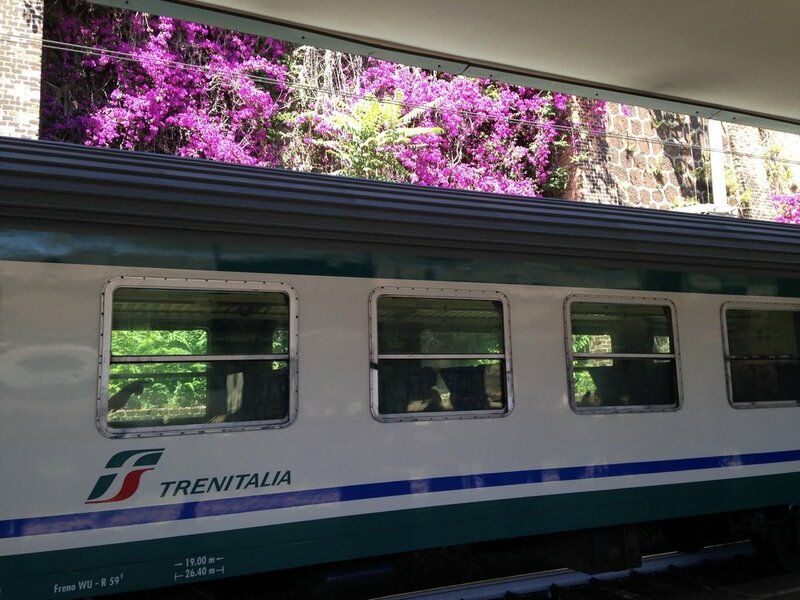 Once arriving in La Spezia there’s a quick train that will bring you directly to Cinque Terre. The train goes through all five towns, so it will be the same no matter which you’re staying in. The best way (and really the only way) to travel between the five towns is to get a Cinque Terre pass. The Cinque Terre pass gets you access to the hiking trails and the train that runs through each town. You can get them at the tourist offices, trains stations, or online here (the online card is only for the train and does not include the hiking pass). There are also taxis that run between the cities. 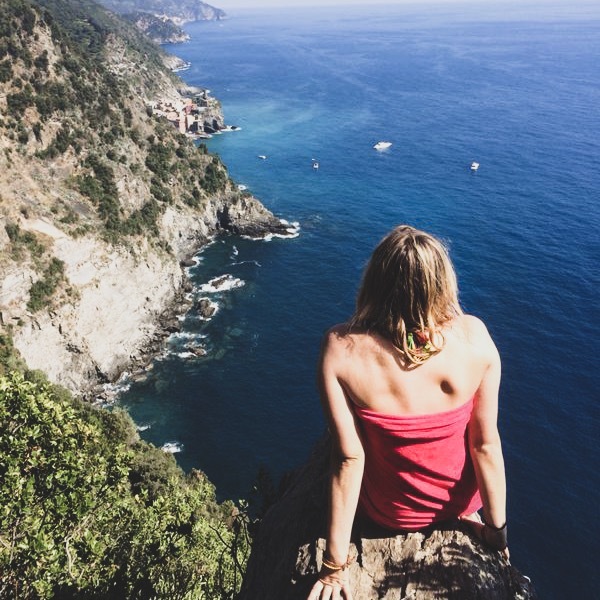 The hiking trails in Cinque Terre offer an unparalleled view of the dramatic coastline. There used to be a walking trail connecting the five cities that was less steep and easier to take on, but it has since closed down. The hikes between the cities are pretty steep so make sure you wear athletic shoes that you can easily walk in. If you are only doing one hike, it should definitely be the one that runs between Monterosso and Vernazza (pictured below). This one was my favorite, and in my opinion the most scenic. Have you been to Cinque Terre? Comment and let me know which town was your favorite!